The Out of Sight Litter Box® grew out of my, Paul I. Pettys – Inventor “Cat-man-doo-doo” to find a solution to the problem of cat litter being tracked throughout our home and ruining new wood floors. The first cabinet was constructed, by me in my garage and put into use by our (at that time) five cats in August 2002. That same cabinet is still in use today. Response from cat owner friends was overwhelming, with many requests for a cabinet of their own, so I made a few more cabinets. 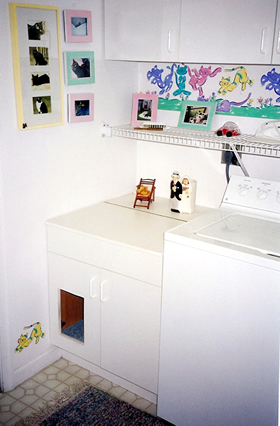 Due to growing local demand, the thought of making the litter cabinet idea into a Company developed, and so Out of Sight Litter Box, Inc. was incorporated, patents were filed and business began on January 1, 2003. A local company manufactured the panels, and I did all the rest. My goal was to make a quality product at a fair price and help other cat owners solve the same problems I had. And, at the same time, grow a business, and in my dreams, someday see my Out of Sight Litter Box® on store shelves. To me, that would be success. Web sales took off with a national advertising campaign – my background was Advertising, Marketing and Graphic Design. Cat Fancy Magazine awarded my Out of Sight Litter Box® with a 2003 Editor’s Choice Award as one of the hottest new products of the year! Many local Pet Stores started to stock and sell my Product. Out of Sight Litter Box, Inc. became a member of the APPMA, American Pet Products Manufacturers Association and in March of 2005 attended the Global Pet Expo to debut my product to the retail market place. My wife and I worked that booth for three long days and were well received! All the large Pet Store chains were very interested as well as hundreds of smaller pet stores and many national mail order catalogs. Over the years, web based sales business and commercial growth was manageable. But, sales for my Out of Sight Litter Box® had grown to the point that the the panel manufacturer I was using then could not keep up with customer orders. The brand name was recognized in the Pet Industry, the product was high quality and in high public demand. To reach the lower price point and much greater profit margins the chain stores required, I signed a License Agreement and contracted with O’Sullivan Furniture, the 2nd largest Ready-To-Assemble (RTA) company to manufacturer and distribute my Out of Sight Litter Box® product. All to proceed towards mass market saturation. I worked with them for three months, making improvements in the cabinet for mass production. After receiving my first royalty check in the mail, I felt I had “made it”. My product was to start production after that new year. But, the second quarterly payment was late. Thirty days later, on Christmas Eve, I got a phone call telling me they would not be paying, and that the company was shutting down. All the greedy “suits” at the top walked away with their pockets full while leaving 2,500 workers unemployed. My forward momentum stopped and was now in the court system. I did win the case, and got my patent rights back, but I would never see a dime from the monetary Judgment. So, that meant I had to start over. After moving from Boca Raton, Florida to Rock Hill, South Carolina would mean having to locate all new suppliers and manufacturers. This took a while, but once finding a panel manufacturer (a local cabinet and woodworking shop) I made a few more improvements in the cabinet and, sales took off once again. That was 2009. Quality does not come cheap. And the prices of raw materials had risen considerably over the past few years, as had labor costs. It has always been my goal to produce the highest quality – long lasting product at a fair price. I know my pricing is higher than much of my competition, but I personally purchased many of the other cat cabinet products to see what $99.00 or more would buy. My conclusion is… you get what you pay for. My brand reputation stands on my quality product, and sales growth has been driven by satisfied customers word of mouth. I know that the cost of quality is a long term value and worth the higher price. My cabinet is different in design utility (use) then any other litter box cabinet on the market. Mine not only hides the litter box, but because of my patented design features, my Out of Sight Litter Box® stops litter tracking and also keeps the litter box out of reach of mischievous dogs or inquisitive children. I do not take short cuts like many of the other manufacturers do. Photos do not show quality. I use high grade California approved plastic coat melamine, not hot-pressed painted cardboard or paper coated chip board. All my panel edges are sealed with edge banding, even the “blind” edges you won’t see after assembly. You will tell the true quality as soon as you open the shipping box. Once again sales were very good, but the small wood shop that were making my panels had reached their production limit as for the mount of time they had available to manufacture my panels for my product. To increase volumn and lower manufacturing costs I researched China and Vietnam. I did locate a good company that would cut the costs by over a third, but the risk was very high, if one thing was wrong I would have a container of 1,000 poor units. I always had strong convictions to keep my product MADE IN AMERICA, so even if the cabinet cost were more, I felt that my customers would want to support US workers. So far, that decision has been proven right from my customers email comments. With added pressure that the cabinet shop could not continue to keep up with sales, I recontacted Sauder, the largest RTA (ready-to-assemble) furniture company. 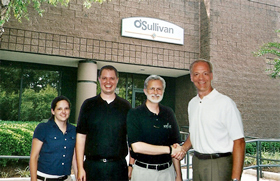 They had turned me down back before the O’Sullivan mess due to their expanding growth at the time. My calls were taken and this time they were very interested. A deal was coming together again. We worked together on the changes I had wanted to make, and they made a few simple changes (that I am indebted to them for) that made my “ugly box” look like fine furniture. Success was in sight. That was the Summer of 2011. I had just placed a new panel order to make sure I would have enough stock to last until Sauder would take over. My then panel manufacturer finished only part of that placed order, and I was out of stock once again, putting on the “Wait List” button on my Order Page. Then Sauder called, and they decided not to move forward with their entrance into the pet products market. I saved that unopened bottle of Champagne. After a few weeks of very deep thought, and feeling what giving up would feel like, I tried on “free time”. Tried to let go. But, still checked my emails to see how the Wait List was progressing. After reading all the comments from waiting customers and many long talks with my wife, I decided NOT to quit and try one more time. My endless motivation has been because my customers and I believe in my Out of Sight Litter Box® product, and the fact of needing to get out of debt. To produce the “Sauder” looking cabinet, I would have to start over again for the third time, from square one (they say the third time is the charm). My older cabinets were made with 1/2 inch thick panels, and assembled with screws from the outside. The improved cabinet is made with 5/8 inch thick panels which allows the use of hidden pins and cams. The thicker panels required the need of a new shipping box. Change one thing and everything changes. My older box shipped well, but I did have some units arrive with damaged panels. Which is not good for you the customer, and not good for me. The shipping box was re-engineered by adding protective foam that gives me peace of mind, and you panels in great condition, ready to assemble the day it arrives. Another change I always wanted, was to the cabinet’s back panel which I always hated. It was a thinner less expensive board that was nailed on. The back is now made from the same panel as all the others, and makes the back look as good as the front. This allows the cabinet to be free standing, no longer does it have to be against a wall, it can be placed anywhere in a room, used as a side table or placed in the middle of a room. As for manufacturing the new cabinet panels, I found yet another local wood working company. 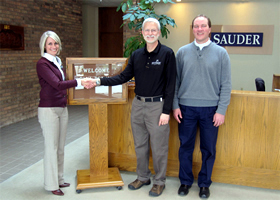 Their main business was making very high-quality, high end (expensive) kitchen cabinets and custom work. But, sadly after two good years of panel production and sales, the economy picked up for their higher profit work, and they could not keep up with my sales. So, at the start of 2014 my search for a Panel Manufacturer began once again, and the Wait List Button went back on my website. To make a long story short, I found my dream come true. A large USA furniture and panel manufacturer only a two hour drive from my home, Achieva Furniture, a part of Funder America, Inc. located in Mocksville, N.C. Their over 100,000 sq ft plant is an independently operated firm that brought the most sophisticated equipment and technical expertise from European resources that make the facility the most modern and complete of its type in the industry. My Out of Sight Litter Box® product is the smallest production run they have ever excepted, but, they “see great potential” for future growth. Instead of cutting one sheet at a time, they cut seven. Instead of hand feeding each panel during edge banding they are totally automated. During my plant tour, I was like a kid in a candy store overwhelmed with excitement (tears came to my eyes, my dream had come true). They have been very understanding, and wonderful to work with. My first order was 5 times the quantity that I normally order, and about 5 times smaller than they had ever run. But, as I see it, they have the unlimited production potential to allow Out of Sight Litter Box, Inc. to finally grow into the Company that it can be. For me, the relief of never again having back orders for customers due to selling out and having to wait for more stock is such a joy. And now I will finally be able to use my Advertising and Marketing background to let the World know about the Out of Sight Litter Box®. Success is never giving up. Oh, and that saved bottle of Champaign, it was shared with all the employees of Achieva with a hardy “Cheers” as the FedEx truck drove away with the first load of customer orders! Yes, dreams do come true! Achieva Furniture / Funder America, Inc.
“My”, and I use the word, my, because I am the Inventor and the one who will be taking care of your order. Yes, Out of Sight Litter Box, Inc, is incorporated and so a Corporation, but it is me who is responsible for, and proud of, the quality of this product. I could use the words “us” or “we” or “our” to describe “the company” in all the web site text, but the truth is, I have worked too long and too hard, for you to think you are just dealing with another big uncaring company – you are dealing with me, Paul I. Pettys, “Cat-man-doo-doo”. You are the link to my next sale. And I want you to be happy with my Out of Sight Litter Box®, and the service you get. Success? Not quitting, not giving up, is my new success. Following through the entire process is my satisfaction. Knowing that I have produced a high-quality MADE IN AMERICA product that does what it says and works. And having you happy with my Out of Sight Litter Box® is my new success. And if I sell one more than yours, I’ll be that much closer to getting out of debt! My hope of getting my product on retail store shelves will never happen, the mark up margins they demand can not be achieved. But, with the internet and now social media – my hope is that happy customers will spread the word! Out of Sight Litter Box, Inc. (that would be me) believes in giving back, and donates a percentage of net profits from sales. Out of Sight Litter Box, Inc. contributes funds that help Shelters with the day to day operational costs and also help bring awareness to my customers of their local no-kill animal shelters by posting contact information and links on my web site. On the Assembly Instruction sheets there is a special email address for each purchaser to send information regarding their local no-kill animal shelter. A random drawing each month is made from all emails to that special address, from which a single chosen shelter will receive that months percentage of sales as a donation. I encourage and promote spay and neuter programs. If you own a cat, have it spay or neutered. If you are getting a new kitten, have it spay or neutered. Pet shelters are filled with kittens and cats looking for a loving home, please find more information and resources on my Shelters Link page. Our Casper and Callie are rescues. Our Mia (home page web movie star) and Buddy both “showed up” on our back porch, never left, and now are very special loves of our indoor only furry family. All have been “fixed”. My business is dedicated to delivering a Patented product that is a unique solution to hiding the kitty litter box, stopping cat litter tracking and keeping dogs or inquisitive children out of the litter box. The Out of Sight Litter Box® makes your life as a cat owner, easier. My business is keeping your cats “business” Out of Sight! 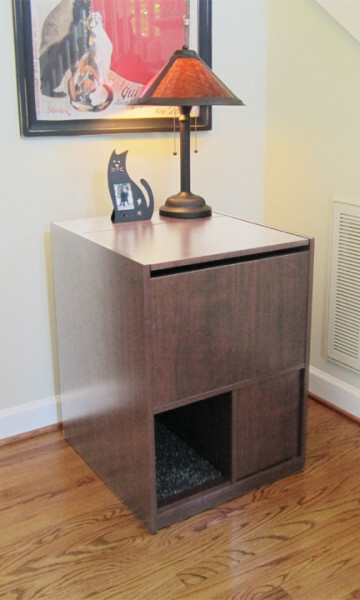 Thank you for taking the time to read “My Story” and about what makes my Out of Sight Litter Box® your best choice in litter box cabinet systems. … for the, blessings, provisions and faithfulness. I need to practice gratitude daily. Gratitude is not an attitude, it’s a response. Please tell your friends! “Like” and “Share” on FaceBook, thank you! Inventor, Founder, President (and all the other stuff involved too) Out of Sight Litter Box, Inc. The sweetness of knowing God and His love when you have nothing else to cling to is life-changing. Dad, I really miss you. I didn’t give up.